"Alright, did everyone understand? If not, tell me now so I may repeat it one more time." Shikamaru said to his audience. The entire team was chilling inside one of the factories, and there were a bunch of vats with bubbling chemical juices. Most people nodded, and other just ignored him, like Sasuke, Orochimaru, and Itachi. They new the plan, but they didn't feel like nodding for their own reasons. "Just in case..." Shikamaru muttered, "Let me go over the teams one more time. Team 1: Hinata, Killer Bee, and myself. Team 2: Orochimaru, the 2nd Hokage, and Hidan. Team 3: Sasuke, Kabuto, and Asuma. Team 4: Anko, Itachi, and Kidoumaru." 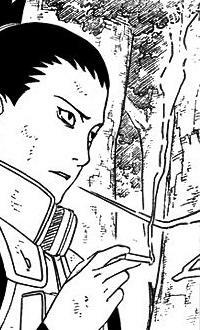 Shikamaru scratched the back of his head, and couldn't believe how much of a drag this was. At least he wasn't with either of the Uchiha brothers or Orochimaru. Actually, he had probably the most pleasant team. "It's time to move out." he finally said, getting up from his crouched position. Everyone suddenly vanished in their own way, each team heading in a different direction. The two team members swiftly made their way off of the ocean onto a land that held many buildings and factories on it. "I though you said we were heading for the bridge." Shino asked as they ran towards all the buildings up ahead. "We shall, after we check out this base. There still may be enemies lurking around here. If we stop them now there shall be no more reinforcements." "But if the objective is to find the president and kill him or her what would be the point of hiding in their base." "You have a point Aburame. But its not worth risking. If were in the middle of the fight and then their reinforcements arrive your going to want to have came here first." 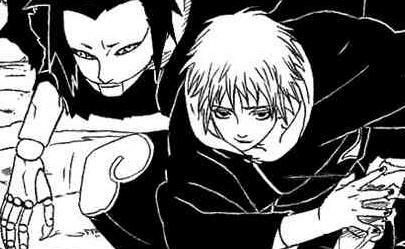 Making into the city Sasori continued "Dont worry eager one, our search will be short."